Introducing: (0:00) 1. Oh, You Beautiful Doll (Nat D. Ayer); (0:31) 2.Gee, But I Like Music With My Meals (Nat D. Ayer); (1:03) 3. Red Rose Rag (Percy Wenrich); (1:25) 4. Take Me Back To The Garden of Love (Nat. Osborne); (2:03) 5. That College Rag (Albert von Tilzer); (2:39) 6. Ragtime Violin (Irving Berlin); (3:01) 7. A Girlie Was Just Made To Love (George W. Meyer); (3:34) 8. Everybody's Doin' It Now (Irving Berlin); (4:06) 9. The Gaby Glide (Louis A. Hirsch); (4:48) 10. I Want a Girl (Harry Von Tilzer). Arranged by Herman Avery Wade. 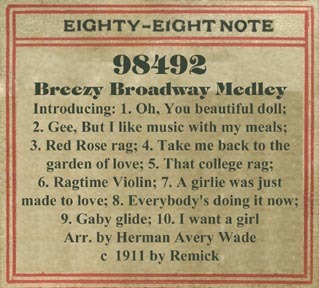 aeo98492_Breezy_Broadway.mid (62 kb) MIDI performance tempi are selected for singing (not for wild dancing!). All the songs are from 1911. 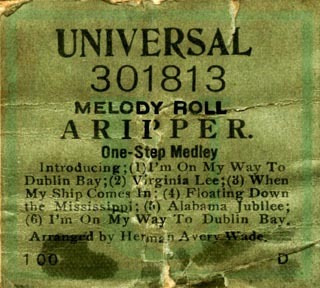 Thanks to Stephen Kent Goodman, Ken Vinen, Jerry Bacon and Alan Mueller for their help identifying the songs and roll number. 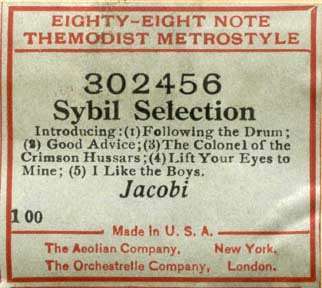 Aeolian 30245, "Sybil Selections", medley, Introducing: 1. Following the Drum; 2. Good Advice; 3. The Colonel of the Crimson Hussars; 4. Lift Your Eyes to Mine; 5. I like the Boys. Music by Hungarian composer Victor Jacobi (1914), English lyrics composed for 1916 Musical Play by Harry Graham & Harry B Smith. The show opened on January 10, 1916, and ran 169 performances at the Liberty Theatre on Broadway. "SYBIL" -- Frohman, Rieh & Harris present Technology this evening with Julia Sanderson, Donald Brian and Joseph Cawthorn together in "Sybil." They found "Sybil" in Vienna and had Harry Graham and Harry H Smith make an English version of the book. The original music by Victor Jacobi, who wrote "The Marriage Maket," they retained intact, for it was a lot better than musical comedies are usually equipped with. They put these three stars in it -- there was just the right sort of part for each of them -- and they produced it at the Liberty Theatre, New York. That was just after the holidays. It "caught on" at once and for months the house was sold out for weeks in advance. At last Miss Sanderson and the others demanded a vacation and the management was forced to give it to them. Tonight they present it as "Tech Night" and feel confident that it will "pass judgement." 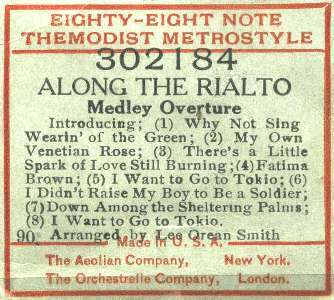 Aeolian 302184, "Along the Rialto (Medley Overture)", medley, Introducing: 1. Why Not Sing Wearin' of The Green? 2. My Own Venetian Rose; 3. There's A Little Spark of Love Still Burning; 4. Fatima Brown; 5. I Want To Go to Tokyo [slow]; 6. I Didn't Raise My Boy To Be A Soldier; 7. Down Among The Sheltering Palms; 8. I 0Want To Go To Tokyo [fast]. Arranged by Lee Orean Smith. Universal 302833, "Ziegfeld Follies of 1916", medley, Introducing: 1. I've Said Good-bye to Broadway; 2. Have a Heart; 3. Bachelor Days; 4. I've Saved All My Love For You; 5. I Left Her on the Beach at Honolulu; 6. I've Said Good-bye to Broadway. Music by Louis A. Hirsch, Jerome Kern and Dave Stamper. Arranged by Edwin E. Wilson. 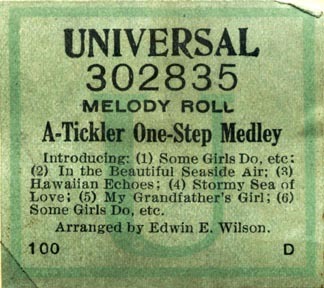 Universal 302835 "A-Tickler", One-Step Medley, Introducing: 1. Some Girls Do and Some Girls Don't; 2. In the Beautiful Seaside Air; 3. Hawaiian Echoes; 4. Stormy Sea of Love; 5. My Grandfather's Girl; 6. Some Girls Do and Some Girls Don't. 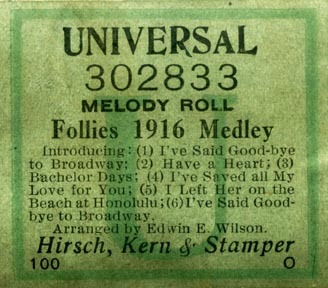 All songs (C)1916 except "Hawaiian Echoes" (1917). Arranged by Edwin E. Wilson. 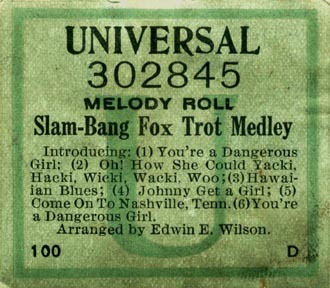 Universal 302845 "Slam-Bang", Fox Trot Medley, Introducing: 1. You're a Dangerous Girl; 2. Oh! How She Could Yacki, Hacki, Wicki, Wacki, Woo; 3. Hawaiian Blues; 4. Johnny Get a Girl; 5. Come On To Nashville, Tenn.; 6. You're a Dangerous Girl. Arranged by Edwin E. Wilson. 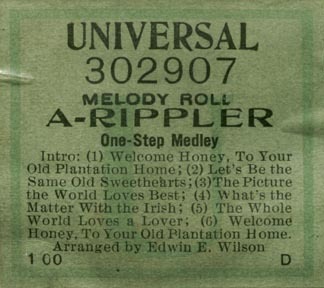 Universal 302907 "A-Rippler", One-Step Medley, Introducing: 1. Welcome Honey, To Your Old Plantation Home; 2. Let's Be the Same Old Sweethearts; 3. The Picture the World Loves Best; 4. What's the Matter With the Irish; 5. The Whole World Loves a Lover; 6. Welcome Honey, To Your Old Plantation Home. Arranged by Edwin E. Wilson. 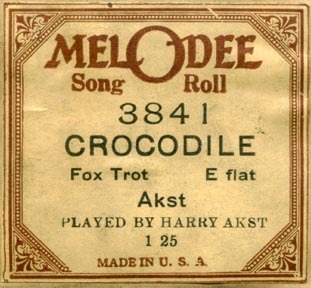 MelODee 3841, "Crocodile", by Harry Akst, played by the composer.